For turning your PC into a home entertainment system, having great speakers is every bit as important as having a high definition monitor, or a fast GPU. People tend to forget about speakers when building their computer, but they can improve your experience every bit as much as the leap from 480p to 1080p content. Speakers are also one of the longest lasting piece of PC hardware you can invest in, often seeing a decade of use without needing repair or update. Selecting the right speakers is easy if you know what you want, and what to look for in your selection. When it comes to speakers, more expensive doesn’t always mean better. You need to know exactly what kinds of features you’re paying for. Some speakers are inexpensive and sound fantastic, until they perish 13 months into use and out of warranty. When you go cheap, you get exactly what you pay for. Cheaper PC speakers sound poor, won’t get loud enough, and break easily. At same time, you don’t need to invest a thousand dollars into speakers for your PC unless you’re going for enthusiast grade audio from a complete surround-sound system. For everyone else, the perfect price point for quality PC speakers is in the ballpark of $100. If you’re paying much more than that, you’re probably paying for something you don’t need for home entertainment. If you’re paying much less than that, you’re probably getting junk which you’ll end up being stuck with for years. Your first decision should be between 2.0 speaker systems and 2.1 speaker systems. 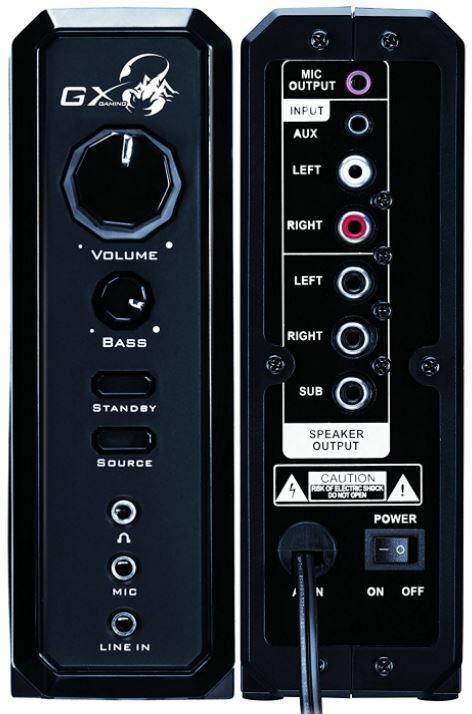 A 2.0 system makes use of two channels, meaning one left and right speaker. Inside those speakers you’ll find the power amplifier driving the sound. That means 2.0 speakers tend to be large because they’re carrying a full body of electronic guts. By contrast, a 2.1 speaker system takes those original two speakers and adds a subwoofer for mastery of lower frequencies of sound. In a 2.1 system, speakers tend to be a bit smaller because their amplifiers are hosted inside their connecting subwoofer. The smaller size doesn’t affect their ability to get the job done, but does make them far easier to mount on a wall. The big difference between these two options is primarily found in the performance of bass, and the size of the system. 2.0 speaker systems tend to take up less space because even though the speakers are larger, you only need to make two spots on your desk. A 2.1 system adds a large subwoofer which also hosts your amplifier. 2.0 systems do an okay job of emulating bass tones, but getting truly accurate, deep bass requires a subwoofer. That’s not to say 2.1 systems are strictly better – they’re not. Great sound systems need to strike a balance between the treble, midrange, and bass frequencies for the ear. For the $100 price-point, if you’re getting a subwoofer, you may be losing qualities from the other frequencies in the process. If you don’t particularly care about having the deepest range of bass tones, you may be better off with a 2.0 speaker kit that emphasizes high and midrange tones we mostly hear in media, and get by with passable bass performance. More wattage doesn’t always mean more volume, or better sound. Brands like Bose have proven that engineering and construction decisions can have giant impacts on the quality and quantity of sound produced. The quality of the materials actually matters because they’re directly involved in sound production. In other words, good design isn’t entirely about aesthetics. Speaking of aesthetics, many people won’t care what their speakers look like. But if you’re looking at some speakers’ every time you’re using your computer, it makes sense to make sure they’re at least not unpleasing to the eye. Designs that begin as shiny and stylish may end up being fingerprint traps, or looking like cheap plastic once they’ve been used for a year. Fortunately, you don’t need to study engineering to start thinking about how the build of a speaker contributes to its sound. One thing you can look for on your own is the size of the enclosure for the speaker. Larger speakers tend to do better with lower frequencies for bass tones. In other words, if you’re using a 2.0 system, you’ll want to make sure you have bigger speakers. Another detail you can pay attention to is the configuration of the speaker cone. When speakers have only one code, it indicates the cone is a full-range driver –a type of driver designed to cover the full range of tones on its own. Speakers with two or three cones run specialist drivers aimed at specific mid-and-high frequency tones, which provides more richness in sound. That balance in tones is key to creating clarity and depth for your audio. If you’ve only got one connection option, then you’re going to be restricted to pulling sound from your computer only. You might want to plug in your speakers to your tablet, phone, or a Bluetooth device. For that, you’ll want to look for extra inputs and connectivity. Most speakers won’t have any independent control system for volume, you’ll just connect them to your computer and use your operating system to make changes. But some PC speakers have their own controls, which is a more optimal setup because you’re better equipped to fine-tune the sound. Most speaker specifications can be ignored because there is no established standard testing methodology. Reviews are more valuable than comparing these types of numbers, or even better, being able to listen to the speakers yourself. If you do find yourself comparing metrics between speakers, you’ll be at the mercy of a brand’s marketing department, which once again, has no established standards to make those numbers into a meaningful figure for comparison. For true-to-life 2.1 surround sound in a big room, you can’t do much better than Logitech’s Z623. This loud 200-watt setup provides you the power you need to fill even the biggest rooms. On-speaker controls can help you dial up and down volume and bass independently of your computer, for a sound you can easily adjust on the fly. If you’re looking to bring new life to movies and games with a new layer of immersion, this is the kit for you. The two satellite speakers are great for clean high notes and mid-range notes, and the massive 130-watt subwoofer, including a 7-inch driver, provides powerful window-shaking bass. 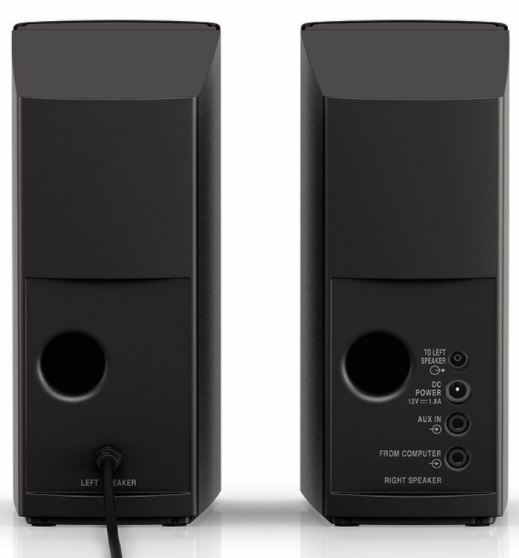 These speakers connect through a standard 3.5mm aux input, or RCA cables. Between RCA and aux, you’ll be able to plug as many as three independent audio devices to the speakers. 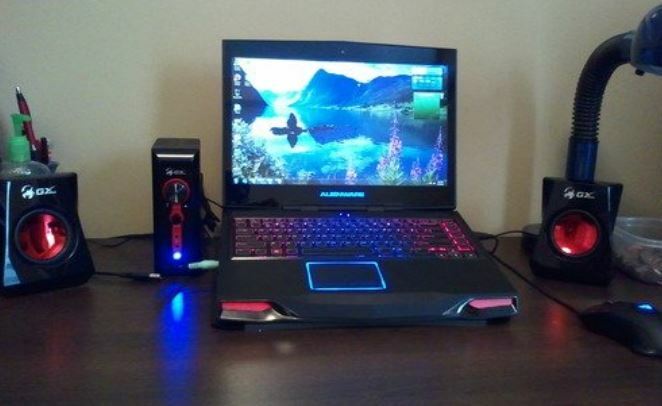 In other words, you can plug in your Blu-ray player, PC, and gaming console at the same time without an issue. The subwoofer weighs more than 15 lbs., which ensures it’s not wall mountable, which shouldn’t be much of a problem for most people. The left and right speakers are 7 and 5/8’’ inches tall, 4 ½’’, wide, and 4 ¾’’ deep. If precise size matters for your positioning, you’ll want to note that the right speaker is slightly deeper on account of having control nobs on the front. The subwoofer is 11’’ tall, 11 ¾’’ wide, and 9 ¼’’ deep, and you’ll find all the audio connections safely on the its backside. If you want a 2.1 sound system for your home office and you don’t need to fill 1,500 square feet with sound in the process, then you don’t need to pay for huge wattage. The Genius SW-G are a relatively lightweight 45-watt set of speakers that provide top-quality sound with an emphasis on high and mid tones over bass, but without totally disregarding those lower tones. The quality of the construction fits the price. Genius include a standby button for quick muting, and the volume and bass controls you want from high quality PC speakers. Although the subwoofer isn’t remarkable, it does provide a full-bodied sound that’s more than adequate for creating a rich multimedia experience. The 2.1 kit has been ergonomically designed to fit into most spaces, made more convenient by the addition of a separate control box you can use to adjust your sound system without having to stand next to a speaker or fumble with a remote. The kit weighs under 10 lbs. and is easy to mount. 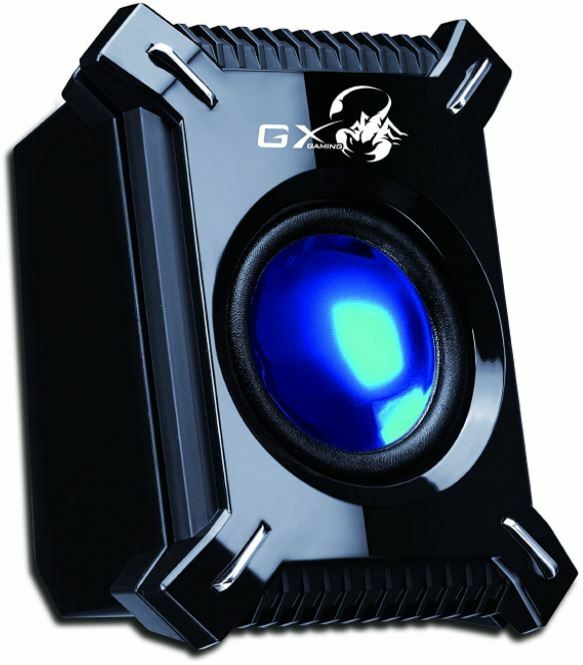 Aesthetically, the speakers stand out with backlit blue LEDs that light up along with your music. You can connect through RCA and 3.5mm aux in/out. Connections are made through the control box rather than the subwoofer, which makes that subwoofer easier to mount. You also get redundant connections on the box, including two mic outputs and two sets of aux connections. The source button on the control box easy to toggle between devices without plugging or unplugging, but one minor drawback is that the control box completely lacks a stand. Few names in the world of sound equipment stand out like the name Bose, but nearly all their products cost hundreds if not thousands. 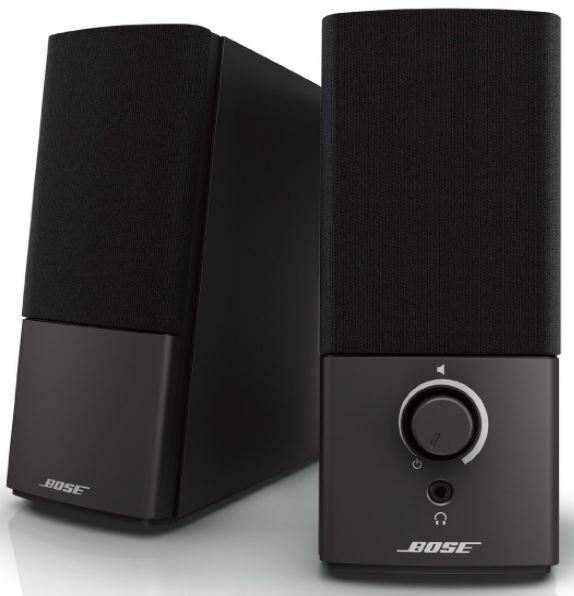 The Series III is their most affordable speaker system, and consequently the most inexpensive way you can access Bose sound. For people who prioritize high tones and mid tones, or otherwise don’t want to have to deal with positioning a bulky subwoofer, this 2.0 channel kit is perfect. 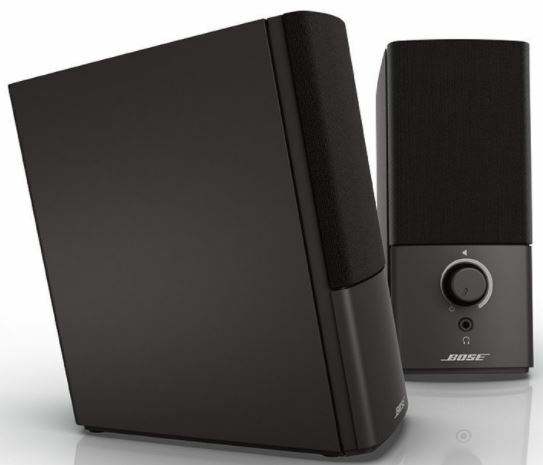 Bose values their brand name; they want to be synonymous with quality. The fact they’re in market at this price range shows their confidence they can provide their signature quality sound without a subwoofer. Upon listening to them, you’ll also notice how Bose engineering allows you to keep a full, clear sound, no matter how high you raise the volume. This kit operates on a relatively low 22-watts, don’t let that fool you. Bose can provide a rich, full sound without needing to draw the same power as brands which only dabble in speaker production. The result is a balanced sound, free from feedback noise, and delivered with luxury in every detail. For example, the volume knob on the front of the speaker has a minor indent, which allows you to know where you’ve turned the dial by touch. The dimensions of each speaker are approximately 6″ deep, 3 ½” wide, 7 ½” tall. That sizeable body ensures these speakers can provide strong bass tones despite not having a subwoofer. On the backside of the connecting speaker, you’ll find two aux input ports, and no RCA connections or other overly ostentatious ports mostly used by audio fanatics. There’s a volume knob on the front right speaker, as well as a conveniently placed headphone jack. The complete kit is extremely lightweight at around 3lbs., which makes these speakers at home on any desk. One thing to note however is that there’s a speaker-to-speaker cord that must be connected, and is about six feet long. Some people aren’t going to be interested in 2.1 sound, and won’t want to find a place for a giant subwoofer under their desk. If you’re not playing to fill a 3,000 square foot room, and you’re not trying to have speakers that are loud enough to scream over a raging party, you’ll be happy with the Bose Companion 2 Series III. In terms of sound for the dollar, you can scarcely do better. 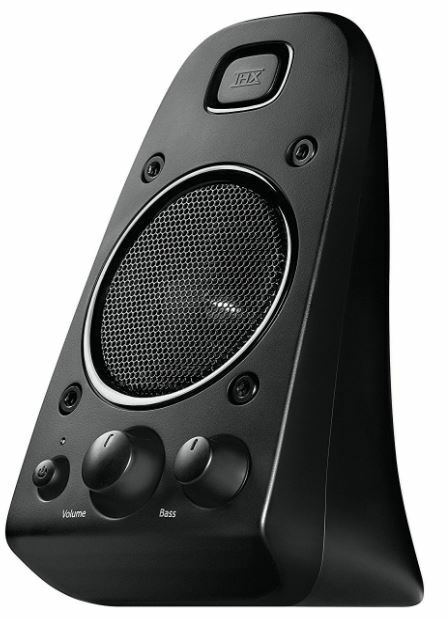 If bass is a critical component for you, then there’s no question, you want the Logitech Z623. This 200-watt monster will fill the biggest rooms with a full-bodied sound, and makes use of a subwoofer that takes more juice to power than all the other speakers on this list combined. The result is a full range of tones that’s ideal for just about any entertainment PC. And if you’re not concerned with being able to blast music into the largest rooms, and have no special affinity for bass, then you’ll be satisfied with the Genius SW-G. It provides the most robust range of tones of any speaker on this list, without neglecting bass like Bose, and without prioritizing it like Logitech. Plus, the control box is an added bonus that’s easy to appreciate after only a few minutes of use.